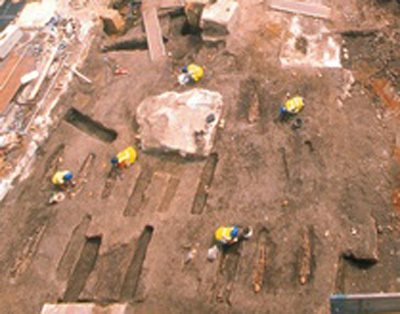 Work on the first phase of the Royal London Hospital dig has now finished. Over 250 burials were recovered from the eastern part of the old Hospital Burial ground. Of these, 177 were single individuals with the remainder comprising anything from 2 to 17 individuals or parts of individuals. Almost all of these had evidence of contemporary 18th century surgical practice and/or post-mortem autopsies. This is the first time that such evidence has been found in the country. A watching brief continues for a few weeks before the next phase of work starts on the western part of the burial ground. Modern disturbance is greater here and there are not expected to be as many in situ remains. Unusually, disarticulated remains, of which there are a lot, are also being sampled and kept from this site because of the unique nature of the evidence for surgical techniques. This is the largest assemblage of surgically dissected human bone archaeologically excavated in this country and indicates anatomical teaching was carried out on a substantial scale. Examination of the remains will tell us much about what techniques were being practiced and about the health of those unfortunate enough to have ended up in the dissection room. When anatomical teaching was set up in the mid-eighteenth century, it was specified by the Hospital Governors that patients were not to be used - from the evidence so far it looks like this was widely disregarded. Future analysis will provide a unique challenge to the MoLAS osteologists!